Prioritizing civic generosity and occupant well-being, the DATA 1 building puts people and community first. 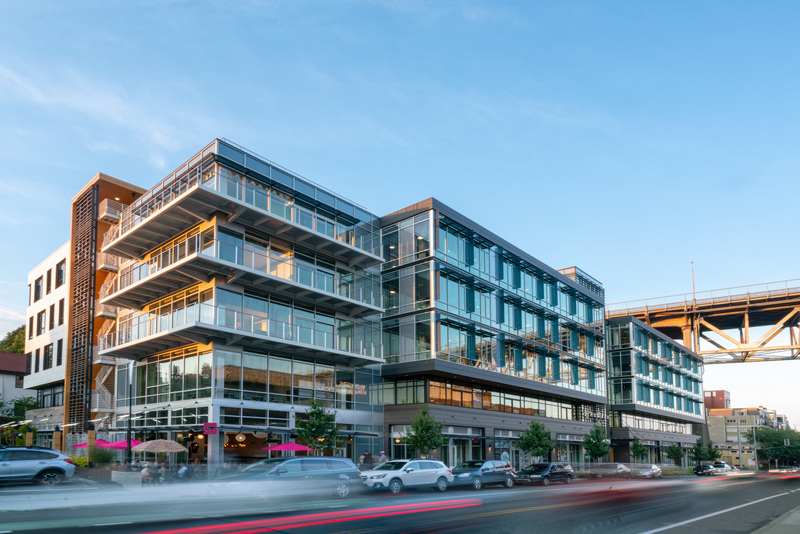 In Seattle, the LEED Gold DATA 1 replaced single-story buildings that were home to several small businesses with 114,000 square feet of class-A office space, spread over four stories above a single 11,850-square-foot story of retail space. Developer CoU LLC saw an opportunity to weave a high-performance building into the fabric of the community. Previously, polluted runoff from the bridge above flowed by the site into nearby Lake Union. Today, DATA 1’s remarkable landscaping improves local ecology by treating 160,000 gallons of that runoff annually. A footpath, lined with art installations, invites the public through the site. And those small businesses? CoU paid to relocate them during construction, then moved them into DATA 1’s ground floor. Image courtesy Weber Thompson. Copyright Ye-H Photography. CoU approached Weber Thompson to take sustainable design elements from the Terry Thomas building, a prior successful collaboration, to scale. Daylighting and energy performance drove design. Shallow floorplates, a central courtyard, and plentiful glazing offer ample natural light, while operable windows provide fresh air. Operable partitions transform the courtyard into an indoor/outdoor space for large events, while balconies and a rooftop deck enable employees to access the outdoors from every floor. The building encourages active living with attractive feature stairways and a dedicated bike garage with a dedicated entrance. Employees love the space. 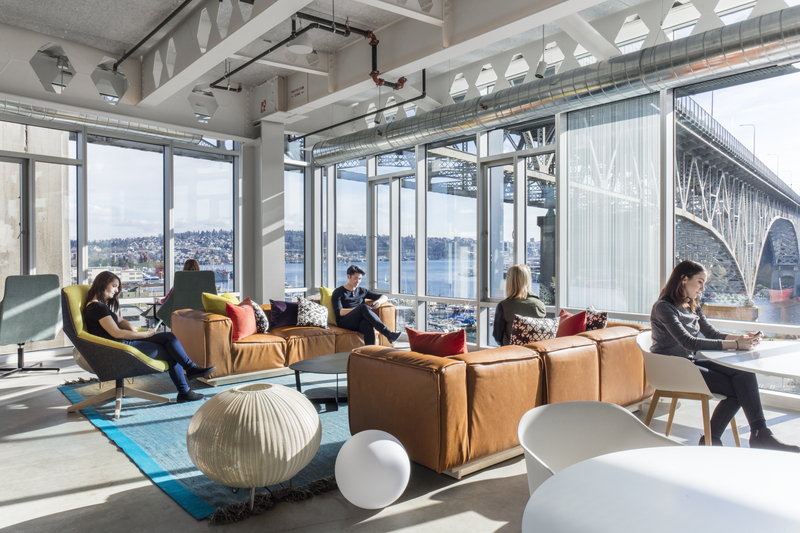 Justen Altaras, Customer Renewals Manager at Tableau, finds it “refreshing to go to work every day in a facility that’s inviting and beautiful.” His favorite places to decompress are the common areas, where large windows allow sweeping views of Lake Union and Seattle. Justen calls the space “very important in regard to job satisfaction,” reporting he would not be excited to transfer to a more conventional office space. For its efforts, the project team earned DATA 1 LEED Gold for Core and Shell. Pursuing LEED was sound business: Tableau, the anchor tenant, required a LEED Gold building. Additionally, LEED kept the team goal-oriented, preventing high-performance attributes from being value-engineered and preserving the sweet spot between comfort and efficiency. Weber Thompson handed the LEED baton to Gensler, who designed Tableau’s space and achieved LEED Gold for Commercial Interiors (CI). While the CI scope benefited from DATA 1’s views, transit access and bike facilities, the biggest achievement was earning all 25 points for optimizing energy performance. Certification enabled the team to pursue best practices beyond code, resulting in an objectively better building. Image courtesy Weber Thompson. Copyright Built Work Photography. The team learned a great deal from DATA 1. First, sustainability attracts value-aligned tenants, creating better and longer leases. Second, generosity requires commitment, but also creates goodwill. Voluntary aspects of the project’s design, such as undertaking to treat stormwater in the right-of-way, were initially difficult, but then found champions and gained their own momentum. Finally, designing for occupant well-being involves difficult but surmountable tradeoffs. For instance, while open floor plans and operable windows improve certain aspects of indoor environmental quality, they also cause acoustical challenges. One remedy is to enclose quiet spaces for focused concentration. As a call to action, DATA 1 represents a corporate shift away from suburban office parks and toward urban infill. “It’s a gift,” says Kristen Scott, Senior Principal of Weber Thompson, “to have a context to respond to.” But this exciting trend has its pitfalls. Failing to understand the community, Kristen emphasizes, could result in “something we don’t want: the anonymity of a building that could be anywhere.” DATA 1 gets this right. Construction can either divide our communities or strengthen them. DATA 1 does the latter.